Giving is as much fun as receiving. I had great fun preparing calender gifts for my mom. She gets one each day. Yesterday I got two fat envelopes in my mailbox. I am a lucky girl. May Britt and Hanne sent me gifts. Advent gifts for every saturday and sunday. As you can see, henging ready to be opend one by one. I have already opened one from May Britt, but I'm not allowed to tell yet. I have some playfull quilting friends. May Britt and Hanne is two of my friends who also love Advent. This year I am exchanging gifts for every sunday (saturday) in Advent with them. Today I sent off this four gifts for May Britt. This is the four gifts I sent off to Hanne. Comming sunday is first sunday in Advent. I hope the gifts get there in time. My mom can't start opening her Advent callender sunday. She have to wait for Desember 1. (monday). Her gifts will be sent off tomorrow. My next door neighbour gave birth to a girl 10 days ago. I made this baby blanket for her. The Teddy Bear is a stitchery witch I put colours on by using paint sticks and different brushes. I think the result looks good. Time to prepare for Advent. Mom and I have a tradition to make small gifts for each other for every day from December 1. through December 24. like an Advent callender. This is actualy a kid thing, but is fun to be playfull as grown up too. I love Teddy Bears! Some time ago I bought theese books with Teddy Bears applique and stitcheries. The books are by Lynette Anderson. 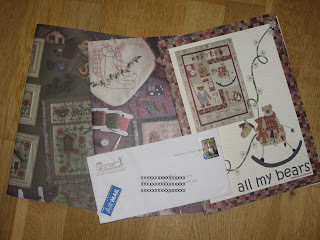 Today I received a letter from Lynette with stitcherypattern for the Norwegian flag for the "All my Bears" quilt. This quilt is to be one of ny next projects. Thank you so much, Lynette. My sewingmachine is at the repaire shop. No fuzz, I have another one if I get the urge to do some machine sewing. I am working on Bea's BOM. Made 3, 10 to go. This week I have spent some time at my mom's. On Monday her local quiltgroup had a meeting and I went as a visitor. It is allways fun to visit other quilting groups. My mom is the white haired lady in front. Study the glasses! This is just to creepy! I have bought accactly same frame for my glasses as my mom. For this meeting we all got a paperbag with precuts to make this felt heart. Show and Tell is my favorit part of a meeting. This ladies had a lot of beautiful things to show. This is a quilt with applique of flowers put together with squares of earth colours. The quilt is quiltet in six parts and put together after quilting. Kind of Quilt as you go metod. One of the ladies had made this Advent calender from a pattert made by a Norwegian designer called AnnaKa. An other lady had used the same pattern to make "Blånisser" for her grandchild. As you can see, wip. This is a beautifull book cover for a bindfolder. I love this one. Several ladies had made bags, but this one was just beautiful. All handmade from a japaneese magazine. I asked if she knew japaneese language!! Hi hi hi. I have made a bag from a japaneese magazine too. The illustrations are really good!! Baby quilts in half square triangles with a center heart. Beautiful colour combinations for boy and girl. The primary golds for my stay at my mom's was this: Make rugs for DS1 and DIL. This blue one is made to match the quilt I gave them a few years ago. The quilt will be used for the guest bed and this is the rug to go with it. I have startet stitching. Today Bea posted a new block. I wonder how many blocks she have made. Take a look at her blog to se all the different ways to do the blocks. Different thread colours, different fabric colours even multicoloured stitcheries. So inspireing. 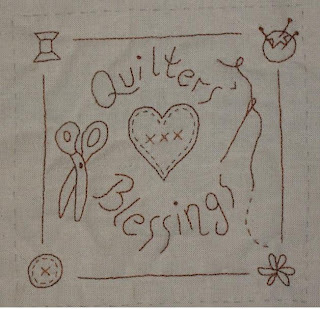 Remember OC scrap quilt mystery at Bonnie Hunters page some time ago? I startet and kept up with the progress untill last couple of steps. I was not pleased with my choices so the hole lot ended up in a box of UFOs. Lately I picked it up again and decided to make two quilt tops for charity from the finished blocks. This is the first one. My plan is to make a blue or offwhite 2 inch border but than what? Any suggestions?? The second top have blocks set on point with grey sashing and I used the half blocks I allready made. This top is smaller that the first one and need to grow to be a desent size lap quilt. What about a red 2 inch border, then a row of four patches and a border about four inches to finish? Please help me out! My scrap bin is full so I can make any scrappy border. I love to spend time in my sewingroom. But sometime it's nice to sit in the couch in the livingroom toghether with DH or friends. I love to have some handstitching to do. I love the couch caddy from Helen (Stitcher's Angel project). When handstitching I allways get all this small thread ends that end up on my carpet and DH's socks. So I made a small thread catcher to hang on the caddy. I found this a very neet idea. Things are happening in my life and I need to take it easy to have a good life. And, life is good! Last week end DH and I went to visit DS1 and DIL. They bought this house i July. The naborhood is nice and quiet. Still a few things left to do, like some painting and curtains. DS and DIL cooking in the kitchen. She made fish'n chips and pumpkinpie from scratch. Delicious. DIL is a good cook. Time to relax in the sofa corner. They have some beautifull fantasy art on the wall. I wish them all the best in their new home.